Oh no, is that Sue from Accounting twerking on the dance floor? Gee, I didn’t know that John drank so much. Who knew that the guys in IT were such party animals. You have to love it. The office holiday party – why the very phrase “office holiday party” evokes certain images and recollections from parties in years gone by and with these images, the good, the bad and the truly ugly. 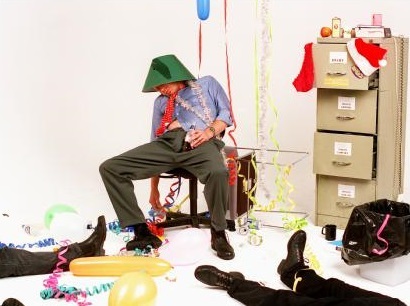 Let’s face it, the office party can be fraught with all sorts of tension. Sure it’s a “party” but well, it’s not the kind of party where you can let down your hair and be that wild and crazy guy. Or better yet, you CAN let down your hair and be that wild and crazy guy but the repercussions of such behavior may haunt you for years to come. Drink in moderation or don’t drink at all. We’re all adults and you know at what point you start to get silly. You shouldn’t even come close to that point. You want to leave the party with your reputation intact and being sloppy and foolish is not an impression that will help you to further your career. Take the time to engage in “real” conversations with your co-workers. It’s a party so you shouldn’t spend the night bitching and moaning about work. Learn more about your co-workers hobbies, where they like to travel, how they spend their weekends, the last movie that they have seen and more. Don’ talk ABOUT your co-workers. It’s never a great idea to gossip and to do so at the holiday party is a recipe for disaster. You know the old cliché the walls have ears. Well, they most definitely do at the holiday party. Don’t be catty! Dress appropriately. That incredibly risqué dress with the plunging neckline and slit up the side may not be the best choice for the party even if it is festive! Keep in mind that how you look and act is how you will be remembered. Don’t decide to become party-time BFFs with the CEO of the company or the Manager of the department into which you are trying to transfer. Be friendly and professional but sidling up to someone at the party for the purpose of career advancement is just plain wrong. Have fun. No really, have fun, because it will show in your smile, in your eyes and you’ll be a much more attractive and sought after person at the party. Standing in the corner eyes downcast and looking miserable is no way to attract friends! And even though it seems like there are a lot of “rules” the office holiday party is a terrific way to celebrate the year’s successes and to look forward with optimism to what lies ahead. Enjoy!